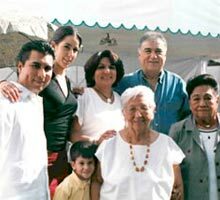 In fact, “la familia” (referring to anyone and everyone even remotely related), is so important and provides such a staple source of well-being and joy that Mexicans often forego matrimonio altogether and remain at home with the papás til age 35 or 57 or “til death do us part.” Mexicans can be compared with “pack animals” in the sense that they value the inter-dependence of a team and are happiest and feel most successful in a close-knit group whereas many native English-speakers are more solitary beasts, preferring privacy, autonomy, and independence or to surround themselves with 1 significant other and 2.5 children.. or a dog who is physically unable to comment on what “is not working” for him/her in the relationship. “Success” or “éxito” for a Mexican is measured by the state of your relationships, as opposed to monetary wealth or goal-attainment. This is why Pedro, your jardinero, is considered highly successful and is well-respected in his community in Mexico, while Doctor Felipe, on the other hand, may be ill-reputed and considered a fracaso, depending on the state of his marriage, parental/sibling relationships, and amistades.